Match 4: We're now four matches into the titanic computer vs human Go battle, and the humans finally have something to cheer: South Korean Go legend Lee Se-dol has won his first match against Google's DeepMind. With the computer program 3-1 up with one match to play the series has already been lost, but it shows that DeepMind can be beaten. In fact the five-hour match was a bit of a thrashing. The head-to-head is considered to be a landmark moment in the development of AI, such is the complexity and nuance of the Go game. On Tuesday we'll find out if Lee Se-dol can narrow the gap further and salvage some more pride. Match 3: Google's AlphaGo artificial intelligence program has now won three matches in a row against top human player Lee Se-dol. That means it's triumphed in the best-of-five series and we're one step closer to a future ruled by intelligent board game-playing machines. 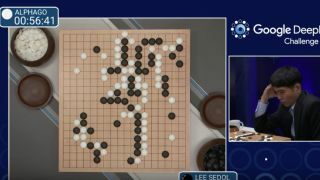 With the AI bot having already won two matches earlier this week the signs weren't good for Lee Se-dol and the human player was unable to claw back any ground in the third match-up. "AlphaGo played consistently from beginning to the end while Lee, as he is only human, showed some mental vulnerability," one of Lee's former coaches told reporters after the event. Match 2: It's not looking good for the humans. AlphaGo has taken its second victory against Lee Se-dol, meaning it's just one win away from the $1m prize pot. While Lee is putting up a good fight, it appears the machines are finally putting us in our place. Also, not to rub salt in the wound, but someone on Twitter pointed out that AlphaGo spends about a minute to play each move, which means Lee actually might have a slight advantage. Match 3 will take place on March 11 at 8PM PT/11PM ET/4AM GMT on March 12. You can see how the second match played out below. Match 1: Well that didn't take long. DeepMind's AlphaGo program has taken the first round against legendary Go player Lee Se-dol, in a landmark moment for artificial intelligence. Lee resigned after three and a half hours of play, with almost half an hour still left on the clock, realising he would not catch up to AlphaGo's lead. Although AlphaGo previously beat the European Go champion, its victory over Lee was not assured; Lee is considered one of the best Go players in the world. But AlphaGo is a self-learning program and has had time to hone its skills since its last victory against Fan Hui. The next round against Lee will take place Thursday at 1pm local time (4am GMT/8pm PT/11pm ET), and you'll be able to watch it, once again, via the stream below. Later today, Google's DeepMind AI will take on Lee Se-dol, one of the world's best players of the board game Go, in a showdown that's set to last several days. The match will take place at the Four Seasons hotel in Seoul, South Korea, but will be live streamed over YouTube to ensure we never forget the exact moment artificial intelligence gave humanity a due thrashing (should it win). In one corner we have Lee Se-dol, currently considered one of the top-ranking Go players (he's second in international titles right now). In the other corner we have AlphaGo, a program that was built by the Google-owned AI company DeepMind. You might remember DeepMind causing a buzz earlier this year when it was revealed that its AlphaGo took on and beat European champion Fan Hui last October. It was a landmark moment for artificial intelligence, but a bigger challenge lies ahead of it this week as it faces a tougher opponent. As well as humanity's dignity, there's a $1 million prize pot at stake, but DeepMind will be donating its winnings to charity should it take the crown. The match will kick off at 1pm local time on March 9, so 4am GMT or 11pm ET/8pm PT (March 8), and you'll be able to watch it all unfold in the live video stream above.